Price: £4 or 320 INR approximately excluding the shipping. Availability: drugstore or online from Mua website. What company claim: All our beautiful palettes come with 12 complimentary shades so you can pick and choose for a variety of looks. They're a soft, blend able texture that glides on with ease. At just £4, you basically need them all. 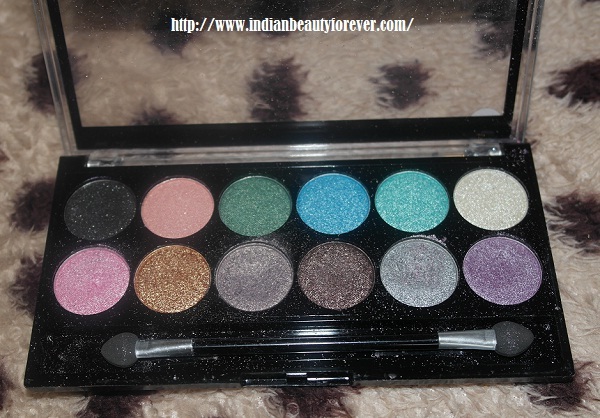 Don't be afraid by the name of this palette - it merely describes how sparkly the shades are! They're glittery but they're not completely full of glitter so they won’t fall down your face or cheeks when wearing. There's an assortment of colours from blues and blacks to purples and pinks. 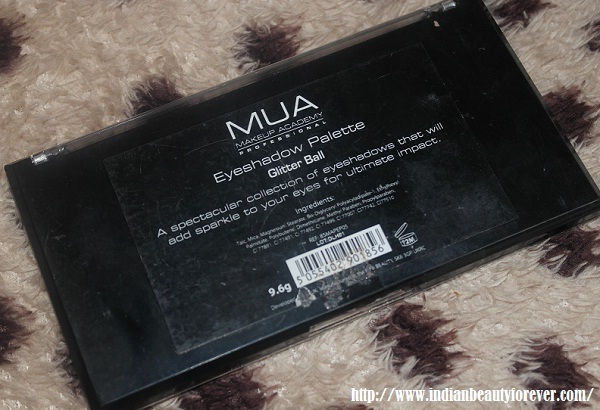 This palette can be worn softly in the day time but also built up for effect in the night. My Thoughts: I bought this palette 3 months ago when I was on my India shopping. 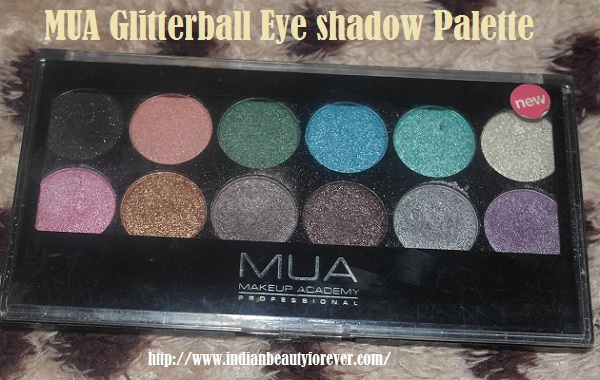 But really wanted to review as didn’t get time so Today I am sharing my views on very affordable and classy palette called glitterball. It’s a complete package, 12 shades in a single palette. All colours are wearable. Some are quite pigmented. You can use this palette for different eye looks .The range is between shimmery and all out sparkly. Shadows stays all day long if use a primer underneath. The Packaging is not bad at all. It is very nicely compact and sturdy enough to carry around while travelling. There are few colours that I think are absolutely gorgeous and stunning. I almost used every day when need to go at work. Texture is mixed. Some colours are pigmented, soft or creamy in texture. There are others that are quite dry and pigmented. You can use all these colours individually and can put some together and make a lovely Smokey eye. It comes with an applicator but I never use that one .Always prefer to use eye shadows brushes. Black: It is pure black colour and contains some glitters in it and highly pigmented and best for creating Smokey looks. Peach pink: It’s quite a warm mid-toned peach with some shimmers in it. Its drier colour as it falls out while applying and less pigmented. Green: It is very pretty green shade; texture is creamy and superb pigmentation. I always wear this shade with my Indian attires. Blue: nice pigmentation, creamy texture again. It is easy to blend. Pale Green: It is almost similar to Green one but it’s lighter than 3rd one. White with a hint of gold: It is one of the most glittery shades .Best for used in evening parties or can use in brow bone area. Pale Pink: I love Pink colour and it’s again a shimmery shade and the texture is smooth to work with. It helps to create gorgeous looks. Copper: One of the best shade among all, It is my favourite too. 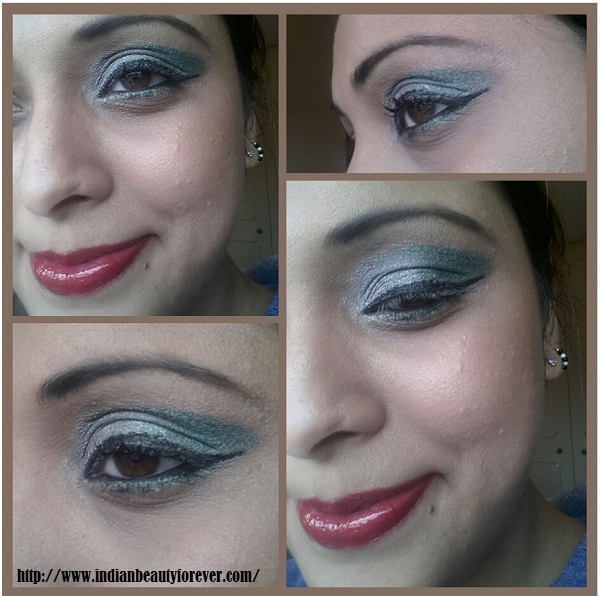 It has glitter and perfect for an Indian wedding look and easy to blend. Taupe: It is very pretty shade .one of the most wearable shade at work and good pigmentation. Chocolate Brown: Dark brown with hint of glitter and like black it is highly pigmented. Silver: Nice pigmentation and very soft texture. I use this colour at work or regular wear as well. Pale Plum- It’s another great shade in the palette. It has glitters as well. Does not crease or fade when worn with a primer. Many wearable looks or Smokey looks can be created. Used with a premier, will lasts easily on eyes more than 5-6 hours. All shades can be used wet as well as dry. Comes in a simple packaging but helpful to locate the colour without opening. Does not irritate your eyes. There are Some fall outs as they are very shimmery and glittery. Shipping charges especially if you are in India. 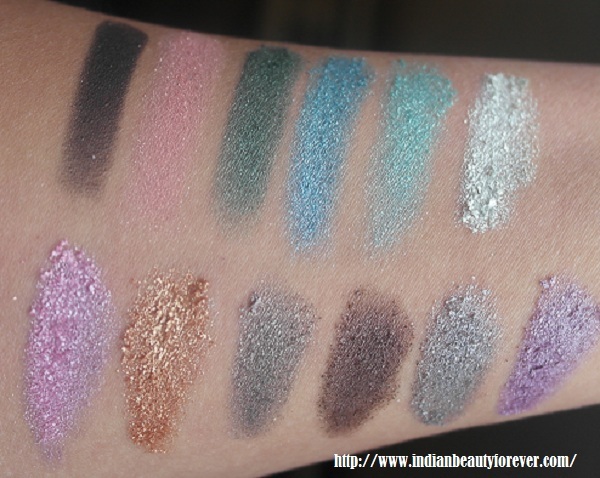 Final Verdict: Want to play with these 12 shades then u should definitely get this one. It stays perfectly all day and night. And best for creating most wearable looks or too dramatic ones. This Palette offers variety few are metallic, some are dry or some are glitter based. It comes in a standard black and transparent plastic which makes it easy to see what is housed inside. It is Great value for money and best for enhancing your eyes. Thanks jeeshan..yes they r v pigmented. Nice review Tej.........and like youe eye makeup.. The price is very good, excluding shipping cost. You look gorgeous! Beautiful eyeshadows, perfectly blended! Very beautiful colours! I love glitter eyeshadows! Love this love MUA, always buying their stuff glad i'm not the only fan.